Pros: Excellent prices, beautiful décor, delicious food. Verdict: Surpasses most theme park food, especially considering price. We went to Islands of Adventure (at Universal Studios Orlando) on Saturday with Hubby’s parents, mostly to see The Wizarding World of Harry Potter. We’re all big HP fans. MIL went last year with some out-of-town family but FIL hadn’t been yet, and neither had we. As soon as we got into the park, we headed for HP, which took us through The Lost Continent, where we passed Mythos. The sign out front said #1 theme park restaurant according to ThemeParkInsider.com. That got our attention. We looked at the menu. Hubby was immediately sold on the place – they have pad thai! The prices were really reasonable, too. We decided to come back for lunch. We could not believe this was theme park dining. We arrived back at the restaurant about noon and were told there would be a 20-25 minute wait. (I don’t think it was quite that long.) There was ice water with lemon slices in a large carafe on the hostess stand with plastic cups to have water while you wait – nice touch. As we entered the main dining room from the reception area, we were awed by the grandeur of the dining room. Totally on theme for The Lost Continent, too. 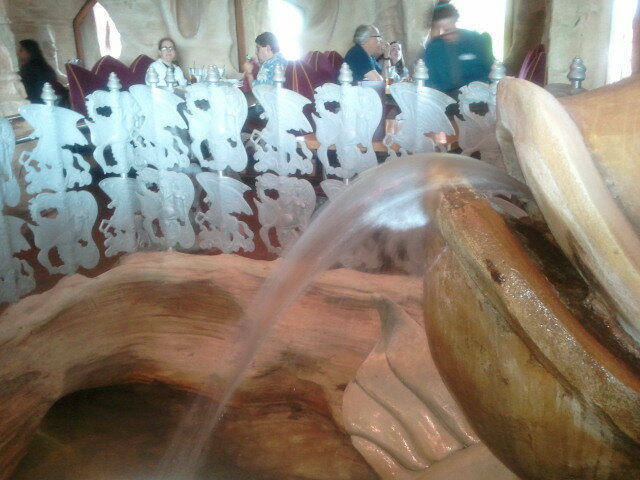 We were seated in a booth next to a fountain. Our server, Patricia, came over quickly to get our drink orders (Diet Cokes are $1.99, iced tea was $2.99). To start, we ordered a Mediterranean flatbread (roasted artichoke hearts, bacon, with cheddar and mozzarella cheese and a red pepper sauce, $7.59) and the day’s pizza special ($8.99), which was chicken, carmelized onion, and (maybe) bacon (don’t quite remember) on a goat cheese sauce. The flatbread was good; the pizza was fantastic. MIL had wild mushroom meatloaf (“a blend of ground beef and pork, wild mushrooms, roasted garlic, caramelized onions and ricotta cheese. Served with Yukon gold mashed potatoes, Jack Daniels gravy, and Tabasco onions.”, $13.99). MIL subbed fries for the mashed potatoes – that’s right, she doesn’t like mashed potatoes. Anyway, the meatloaf was the one thing that didn’t impress us. The flavor was good but the texture was wrong. It was too dense and spongy. We were especially surprised given how enthusiastically our server endorsed it. Maybe she’s never had good meatloaf. The manager came to say hello once when we sat down and again during our meal. He noted my husband’s glass was empty and asked if it had been empty long. Hubby assured him it had not, that he drinks fast, and the manager quickly refilled his glass. Our server was so good about refilling our glasses that hubby drank SEVEN GLASSES of Diet Coke during lunch. On our way out, we stopped at the rest rooms. That was the worst part of the experience. The rest rooms definitely need an overhaul. 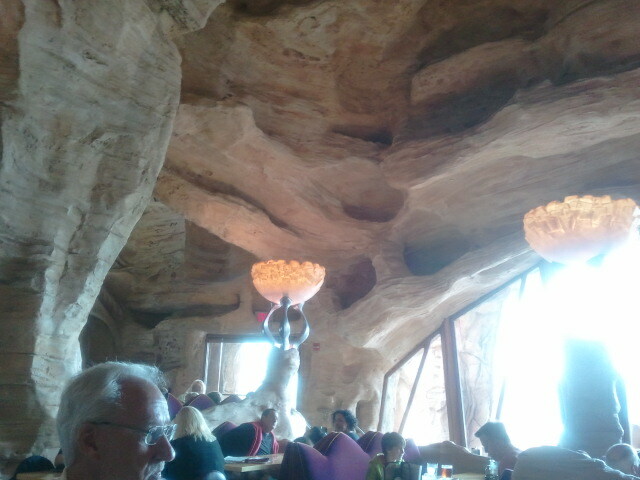 They looked like theme park bathrooms, while the restaurant did not look like a theme park restaurant. Universal needs to drop a few bucks on that. As we were leaving, I heard the hostess tell a guest that the wait would be about an hour. Here’s a tip: you can make reservations for Mythos via Opentable. This means that even if you decide somewhat last minute to go there, you can pull up Opentable on your smartphone and make reservations with minimal hassle. 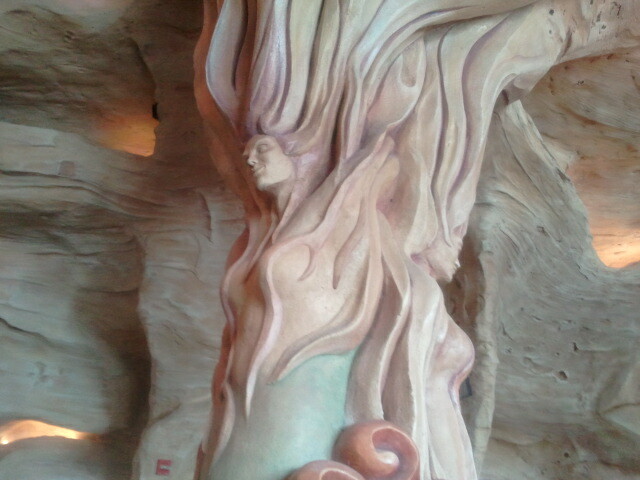 Mythos was such a pleasant surprise. At Disney’s Hollywood Studios during lunchtime, you can pay $8.79 for a 1/3 lb Angus cheeseburger with apple slices or french fries at ABC Commissary (one of the best quick service restaurants in any Disney park, as far as I can tell), or splurge at The Brown Derby, which is $36.-59.99 per person for lunch according to Disney. Mythos really surpassed those options in our eyes. I ate at The Brown Derby once a few years ago and remember the food was excellent…but the food at Mythos was excellent and our meal was less than $28 per person including tip. This entry was posted in great location, great value, Orlando, restaurant review, travel and tagged theme park, Universal's Islands of Adventure. Bookmark the permalink.